There's still love for President Obama in Germany. But the US has been accused of gathering information about German businesses. 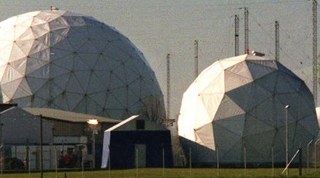 The domes, covering antennas, are part of the NSA listening facility in Bad Aibling, Germany. "But outrage has been muted in Germany. It's playing big in the news, but few politicians have spoken out loudly against it. Chancellor Merkel's spokesman has merely described it as "irritating." "Currently, Germany's foreign intelligence service, the BND, is building its new headquarters in Berlin. At the same time, it is also expanding its own data-mining operations and creating a program that looks a lot like a smaller Prism." Quoting Der Spiegel: Germany's ardor for Obama has cooled markedly since his last visit — then as the Democratic presidential hopeful running for office in July 2008, when 200,000 people chanting "Yes We Can" came to listen to his speech in Berlin's Tiergarten Park. On Wednesday, the crowd will be much smaller — some 4,000 invited guests will listen to Obama's keynote speech in front of the Brandenburg Gate, and some of them have been pulling out of the event because of the intense heat exceeding 30 degrees (86 degrees Fahrenheit) Celsius in Berlin, reports said. Officials have been trying to find people to fill the empty seats. The magic has gone. There haven't been big crowds lining the metal police barriers to catch a glimpse of the president. "Yes We Scan" has been a popular headline in German newspapers in recent days.